If you play ice, roller, street or floor hockey, you probably have one or more pairs of gloves with holes, tears or rips in the palms. How many times have you had to buy a new pair of gloves or spend $60 to send them out to be re-palmed and wait two weeks or more to get them back? There was probably nothing wrong with the gloves other than damaged palms. The Palmsaver will solve this problem! The Palmsaver is a repair kit for the palms of your hockey gloves. There is no question that this system is the quickest, easiest and most durable solution to repair the palms of your hockey gloves and get you back in the game. The material is made from high quality synthetic material that is strong and light weight. Each kit is available in black, and comes complete in either a right or left hand model with pre-cut sections for the palm, thumb, fingers and one oversized finger. The oversized finger section can be used if a seam or gusset (area between fingers) is ripped or split. The material is extremely durable, yet thin enough so it will not affect your feel on the stick. The back side of the material is coated with a super sticky adhesive and release liner. The adhesive is unaffected by sweat, water, temperature and just about anything else you can think of. Once it is installed, you will have a long lasting palm repair that will not move, shift or peel off. The Palmsaver is formulated to fit senior size gloves. However, the kit can be used on smaller gloves as well. Simply trim to fit as required. This product can also be used to repair the palms of goalie blockers. NICE! 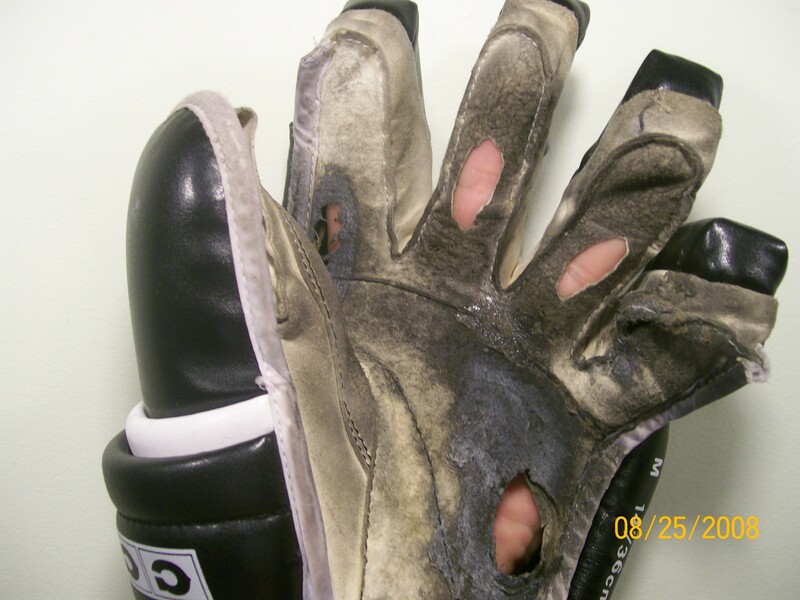 Repair Your Gloves, Get Back in the Game! Whether a parent of a hockey player or a player yourself, having the right equipment is essential to ensuring a good game. Participants of floor, ice, roller or street hockey play hard. In doing so, they tend to wear out expensive hockey gloves; especially in the palm areas. Costly to replace, an innovative and money-saving solution is the Palmsaver. 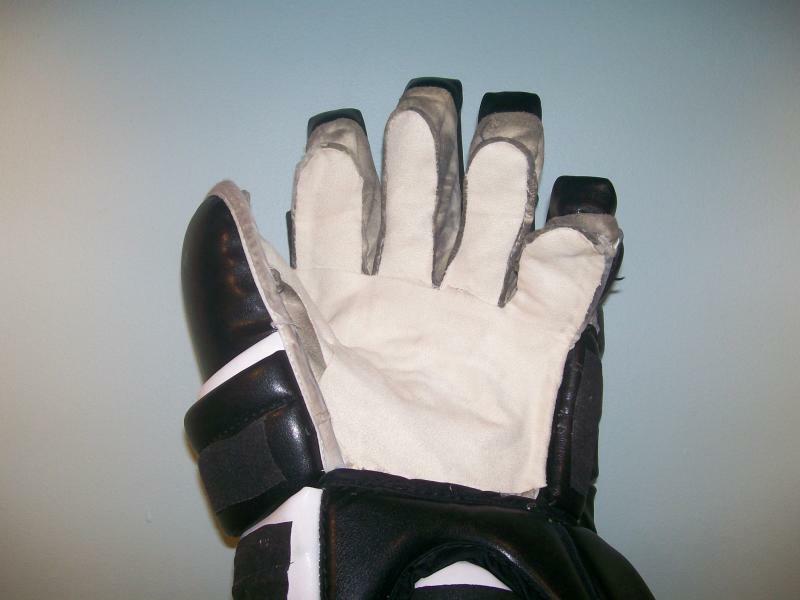 A low-cost option to repalming hockey gloves, the Palmsaver helps to extend the life of worn hockey gloves and offers protection against future wear and tear. Researched and developed over a 25 year period, the Palmsaver uses strong, light-weight synthetic materials in conjunction with superior adhesives resistant to friction, heat, sweat, water and other hazards. These materials and compounds have been proven to be the most effective in hockey glove repalming and glove preservation. The Palmsaver is a unique glove repair kit. An alternative to traditional hockey glove repair, users have the ability to fix their own gloves without having to find a repair shop and waiting up to two weeks for expensive, time-consuming repair work. When using the Palmsaver to repalm hockey gloves, users must first decide if they wish to order a kit for a left or right-handed glove. To ensure continuity and equal wear, if wishing to use the Palmsaver on both left and right-handed gloves, two kits should be ordered at the same time. Pre-cut sections for the palm, thumb, fingers and an oversized finger ensure hockey gloves will be thoroughly repaired, reinforced and protected. When repairing, the oversized finger section can be used for gloves that need repairs along the seam or gusset; which is the area between the fingers. Although this material is durable, it is also ultra-thin. Users will not feel any difference when using their repaired gloves. Click on the link below to purchase your Palmsaver. The cost of each kit is $11.99 for orders in the USA and Canada. FREE SHIPPING ON ALL ORDERS TO THE USA AND CANADA! The Palmsaver is no longer available to New York state residents on this website. Please call 716-390-6989 for urther information. Please use this link to contact us anytime with questions or comments . We would like to hear from you! If living in the U.S. or Canada, the cost of the Palmsaver is only $11.99 and includes free shipping; regardless of order size. For more information or to ask any questions regarding ordering or product usage please email info@thepalmsaver.com. Created for hockey gloves, the Palmsaver is versatile and can be used in the same manner to repair and protect a soccer goalie’s gloves. Remember to order two kits, one for each hand, and help preserve the life of your gloves today. HTML clipboardThe Plamsaver is created using a proprietary process. All rights reserved.